© 2014 Livingstream.com.sg. All rights reserved. Medical researchers report that there is virtually no function or reaction in the body that can take place without the presence of water. Approximately 75% of our body weight is water and water makes up over 80% of our brain and 90% of our blood. Since water is an integral part of everything the body does, there is now evidence to indicate that insufficient hydration of the body can, in itself, lead to or exacerbate specific health conditions and illnesses. Water therapy has been reported to reverse or minimize such conditions as premature aging, arthritis, heartburn, back pain, asthma, hypertension and migraine headaches…to mention just a few. Water is an important aspect of healthy living and we all know to drink sufficient water daily to keep our bodies functioning optimally. As such the quality of our lives is tightly related to the quality of the water we drink. If you are concerned with the quality of the water that you and your family are consuming, this is the site for you. 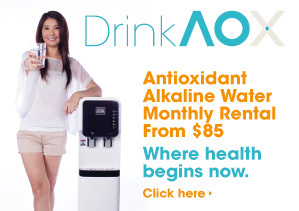 Besides introducing the latest in water filtration technology, we have rich content on water and your health. Welcome! WASHINGTON-Long-term drinking of chlorinated water appears to increase a person's risk of developing bladder cancer as much as 80 percent according to a major new study Scheduled for publication later this month.